The next time you visit Market of Choice, be sure to look for the 100% recyclable, non-woven polypropylene reusable Art Bags, which feature the work of commissioned local artists and help support yours truly. The newest bag in their limited-edition art bag series features artist Blenda Tyvoll of Beavercreek, Oregon. That’s right! For each beautiful bag sold, $1.50 goes to support arts organizations, such as ours. These sensible shopping bags also make great totes for art supplies, books and more, so be sure to purchase several. 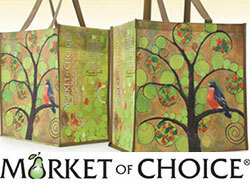 For a full list of arts organizations that Market of Choice supports, visit www.marketofchoice.com/eco-efforts/art-bags.